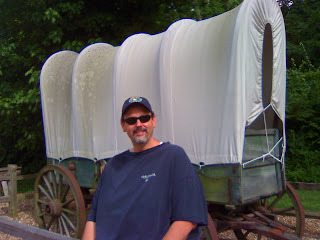 Sightseeing in St. Charles, Missouri... Me in front of a wagon similar to what the settlers used to make the move "West." The oldest house on the Missouri River, 226 years old. 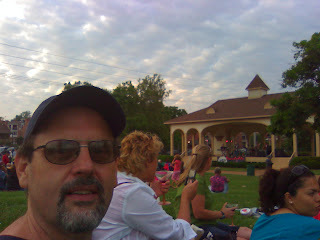 Blues Concert in the park by the Katy Trail. Bonedaddy and the ***** (I could never see the name of the band). 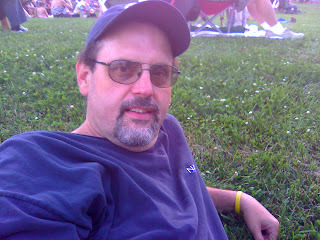 Chilling in the grass listening to blues, and praying there are no chiggers. 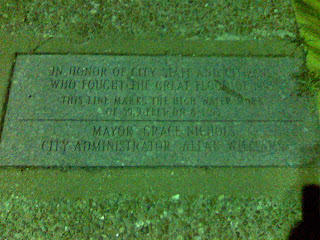 Marker Commemorating the 1993 flood. St. Charles is a city in, and the county seat of, St. Charles County, Missouri. It lies just to the northwest of St. Louis, Missouri, on the Missouri River, and played for a time a significant role in the United States' westward expansion. It is the second oldest city west of the Mississippi, founded in 1765 as Les Petites Côtes, "The Little Hills", by Louis Blanchette, a French Canadian fur trader, and was the last "civilized" stop for the Lewis and Clark Expedition. 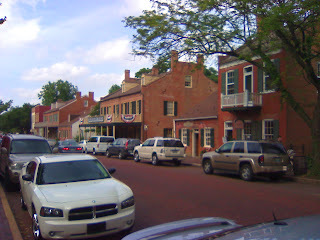 The city served as the first Missouri capital, from 1821 to 1826. 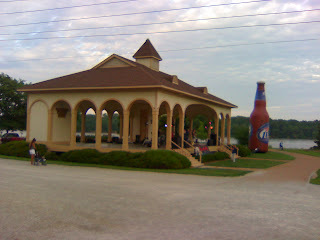 It is the site for the Saint Rose Philippine Duchesne shrine. It is also the home base for the St. Louis National Weather Service Forecast Office, serving central, east-central and northeastern Missouri as well as west-central and southwest Illinois. In the year 1765, a French Canadian, called Blanchette Chasseur, animated by that love of adventure which characterizes all who have lived a roving and restless life, ascended the Missouri, with a few followers, for the purpose of forming a settlement in the then remote wilderness. According to Hopewell's account, Blanchette met another French Canadian (Bernard Guillet) at the site of St. Charles in 1765. Blanchette, determined to settle at the site, asked if Guillet, who had become the chief of a Dakota tribe, had chosen a name for it. "I called the place 'Les Petites Côtes' " replied Bernard, "from the sides of the hills that you see." 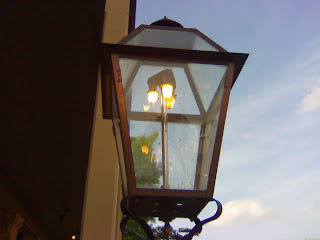 "By that name shall it be called," said Blanchette Chasseur, "for it is the echo of nature — beautiful from its simplicity." Blanchette settled there in 1769 under the authority of the Spanish governor of Upper Louisiana, and served as its civil and military leader until his death in 1793. 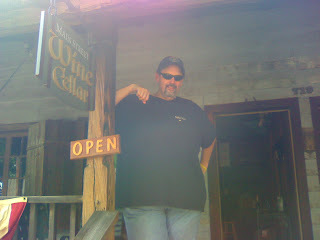 During this time perhaps only a couple dozen buildings were built. Although the settlement was under Spanish jurisdiction, the settlers themselves remained primarily French nationals. The first church, built in 1791, was dedicated to San Carlos Borromeo, and the town became known as San Carlos del Misuri: "St. Charles of the Missouri". This church was destroyed by a tornado in 1916. The first American-born Europeans to settle in the region were Daniel Boone and his family. The Spanish Lieutenant-Governor Carlos de Hault de Lassus appointed him commandant of the Femme Osage District, which he served until the United States government assumed control in 1804. 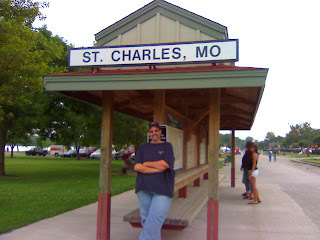 The name of the town, San Carlos, was anglicized to become St. Charles. 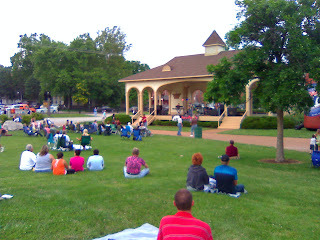 William Clark arrived in St. Charles on May 16, 1804. With him were 40 men and three boats; there they made final preparations, as they waited for Meriwether Lewis to arrive from St. Louis. They attended dances, dinners, and a church service during this time, and the excited town was very hospitable to the explorers. Lewis arrived via St. Charles Rock Road on May 20, and the expedition launched the next day in a keel boat at 3:30 pm. 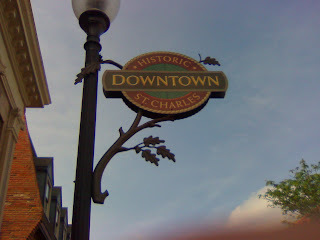 St. Charles was the last established American town they would visit for more than two and a half years. 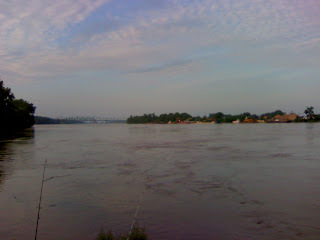 When Missouri was granted statehood in 1821, a decision was made to build a "City of Jefferson" to serve as the state capital, in the center of the state, overlooking the Missouri River. Since this land was undeveloped at the time, a temporary capital was needed. St. Charles beat eight other cities in a competition to house the temporary capitol, offering free meeting space for the legislature in rooms located above a hardware store. 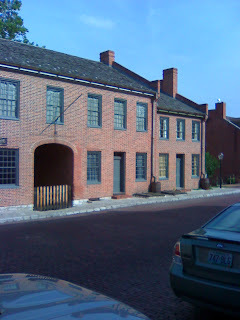 This building is preserved as the First Missouri State Capitol State Historic Site and may be toured. The Missouri government continued to meet there until Jefferson City was ready in 1826.
i was just looking through your pics again...where was that plaque commemorating the 93 flood located? i was curious about flooding while we were there.